Wear a helmet on this one. 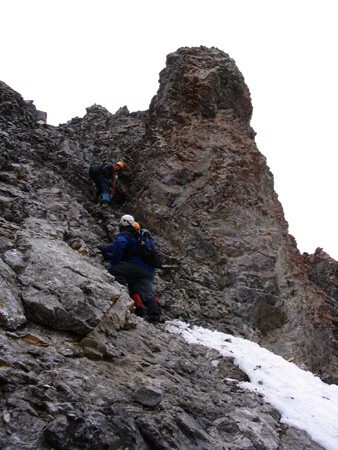 After Climbing Belmore Browne a few weeks previously, I had seen the dark and imposing summit block of what Gillean Daffern calls “The Tiara Peak”. I suggested an exploratory trip on the RMB forum and Andrew Nagura, Mark Nagura and Linda Breton indicated that they would be interested in accompanying me. On a rainy June 11th the four of us attempted this peak and ran into two separate (and experienced) parties making a bid for Tiara’s summit. All of the parties were successful, however, our party was forced to claim the summit via the easier descent route. 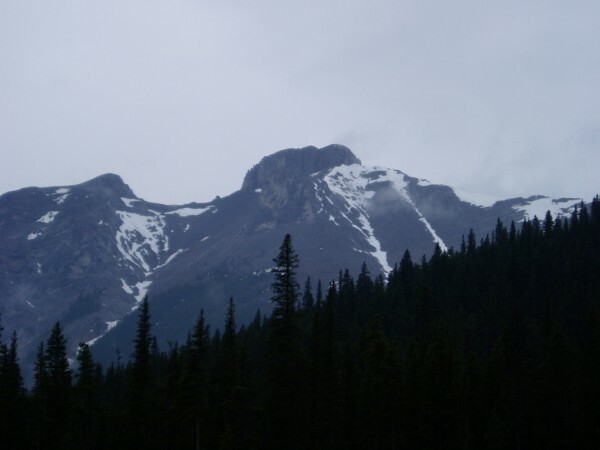 To access the peak park on Powderface Trail as per Daffern’s instructions for Belmore Browne in her Kananaskis Trail Guide. The trail is difficult to locate but once you do the key is to follow the clear cuts and then transfer into a stream bed. When the stream bed forks, keep right and head towards the open scree bay formed between Belmore Browne and the North ridge of Tiara. Pick your line up to the ridge carefully to avoid some rock bands. 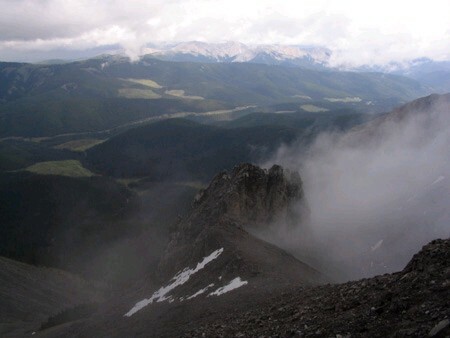 Head south on the ridge until you reach the scary looking summit block. From a distance it looks like mid 5th class rock. However, there are probably three steep gullies on the east face of the decaying summit block that are difficult scrambling, easy technical in class. The rock is brutally loose and on the day of our trip soaking wet with patches of snow. 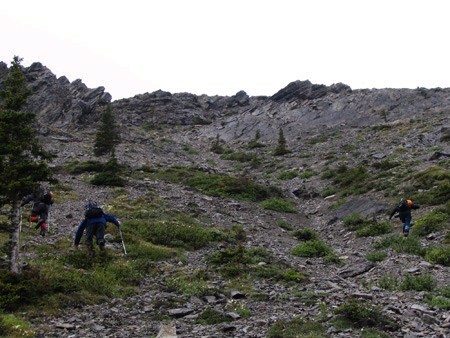 The two other parties appeared to have ascended the first wide gully. That gulley is generally 4th class (super chossy) rock but has what appears to be an ugly technical step about 3/4 of the way up that would seem to be up to low-mid 5th class (but again, really loose). The second gully looked to be more sustained low 5th class type rock and appeared to be more solid. We tried the second gully with Andrew on the sharp end (well… the rope was slung over his shoulder as there was no place to put protection on this crumbling choss heap and protecting a factor 2 fall was not necessary as the run-out was scree). Andrew made it a few meters up, but due to the loose rock and wetness made a wise decision to back down. 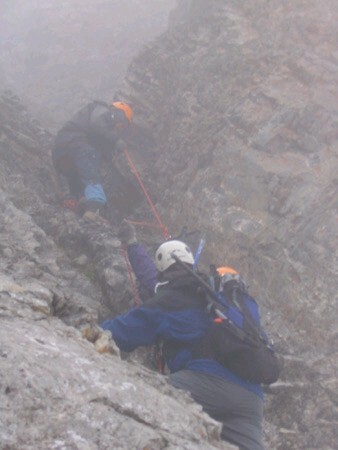 We also tried the first gully but the crux step again proved too loose, exposed and wet. 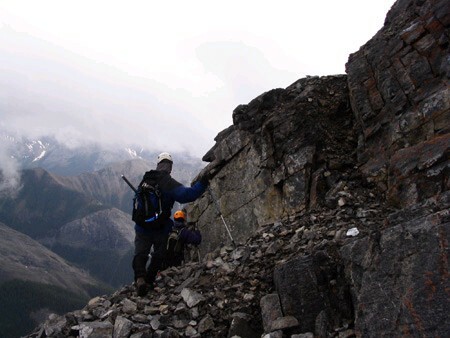 We then decided to traverse the summit block to the West side by heading South. The traverse is second class until you encounter some slabs that have a bit of an exposed run-out. (Careful in the snow). 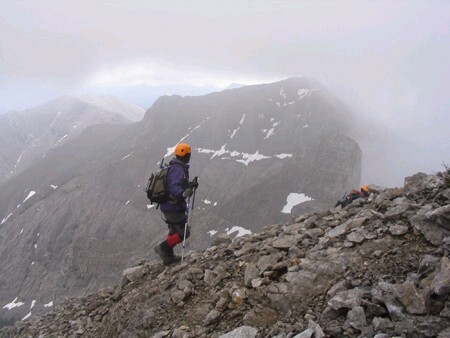 The climb of the rubble filled Western slopes involves a bit of third class scrambling but is quite easy. You can descend to the left branch of the creek bed by descending after you come back around the summit block to the East. Tiara in the distance, picture taken a few weeks prior. Tiara from the summit of Belmore Browne, picture taken a few weeks earlier. 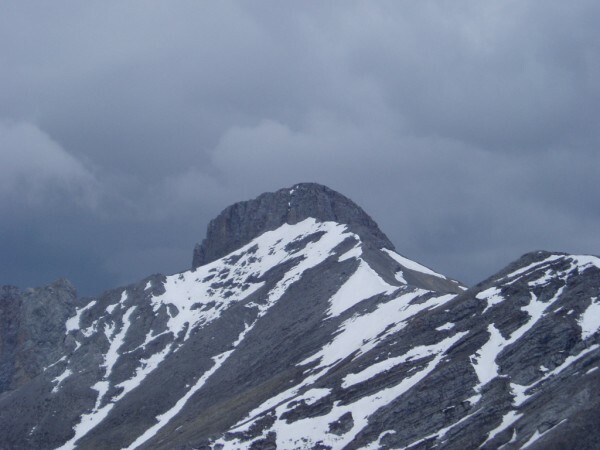 Note small snow patch in what would likley be the first ascent gulley.